In this early work, Rodin shows his young lover, the seamstress Rose Beuret, with a fierce and lively expression of inner passion. Although Grappe, Spear and de Caso/sanders suggest 1970 as the year of modelling, Tancock and Butler propopose a much earlier date (1867-68), arguing that the style of this portrait is similar to other private work Rodin did during these years, while still delivering commissioned portraits ('The Portrait of Mme Roll', for example) in quite another, still conventional style. Assuming Tancock and Butler are right, the bust was made only a few years after the first meeting of the young couple in 1864, when Rodin was working at the Théatre des Gobelins. 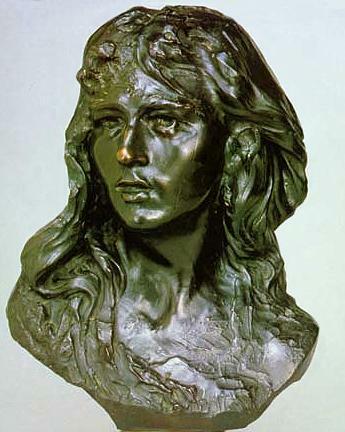 Rodin shows Rose's face with hollowed irises, in the manner of Bernini, and with slightly opened mouth, suggesting a "dramatic expectancy that never recurred in his feminine portraits" (Albert Elsen). According to De Caso/Sanders, the manner of the portrait with the mass of long open hair, the parted lips, the hurt, almost tearful eyes contrasted by the suprised expression of the resolutely turned head makes it a typical representation of a Romantic heroine. The word mignon is one of the most common expressions in the French language, meaning pretty or handsome, but since Rodin used the male form instead of the female mignonne, the authors propose to interpret the title not only as a private endearment and point at the fictional character of Mignon from Johann Wolfgang Goethe's novel 'Wilhelm Meisters Lehrjahre' (1795). Kennst du es wohl? - Dahin! Dahin Möchte ich mit dir, o mein Geliebter, ziehn. Kennst du es wohl? - Dahin! Dahin Möchte ich mit dir, o mein Beschützer, ziehn. Kennst du es wohl? - Dahin! Dahin Geht unser Weg! O Vater, laß uns ziehn. Like Mignon, Rose Beuret was defiant and sometimes jealous beyond all reason. The pronounced bone structure of the face gives it an androgyne appearance, matching Mignon's traits in Goethe's novel. In Goethe´s novel, Mignon finally is not able to adapt to the higher society Wilhelm finds his way into through his marriage with the aristocratic Nathalie. In a nearly prophetic way, the association with Goethe's Mignon character seems to predict the difficulties Rose later encountered, when Rodin grew famous and her role was reduced more and more to that of a housekeeper. In 1877, Rodin used the same proud, nearly angry expression of Rose in his sketch for a statue of the French Republic which he later called 'Bellona', the Roman godddess of War.